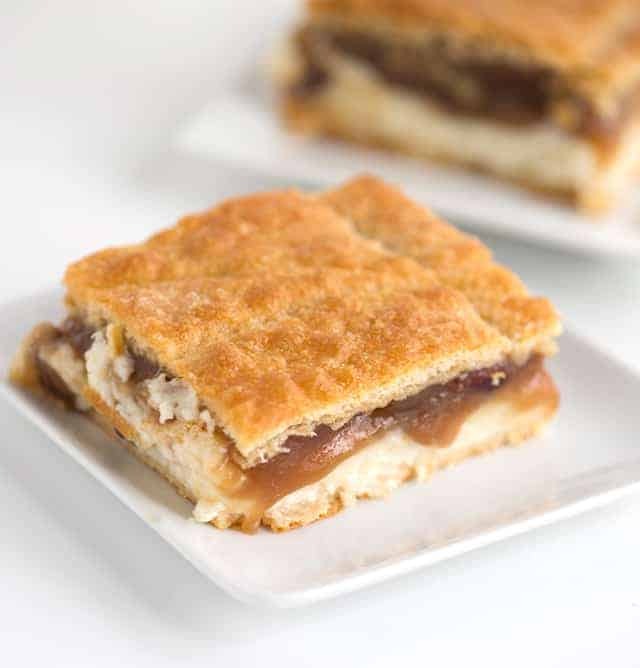 These pecan pie cheesecake bars need to be on everyone’s holiday menu! 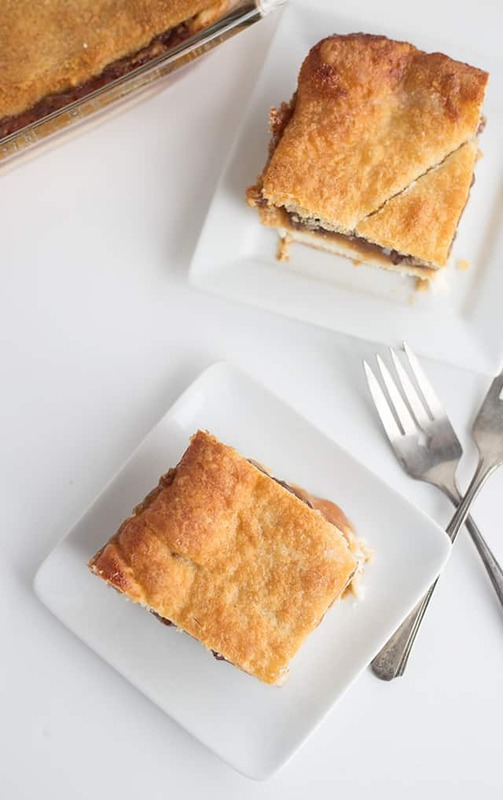 There’s a delicious and flaky crescent roll crust, a thick and creamy cheesecake layer and a gooey pecan pie filling on top. 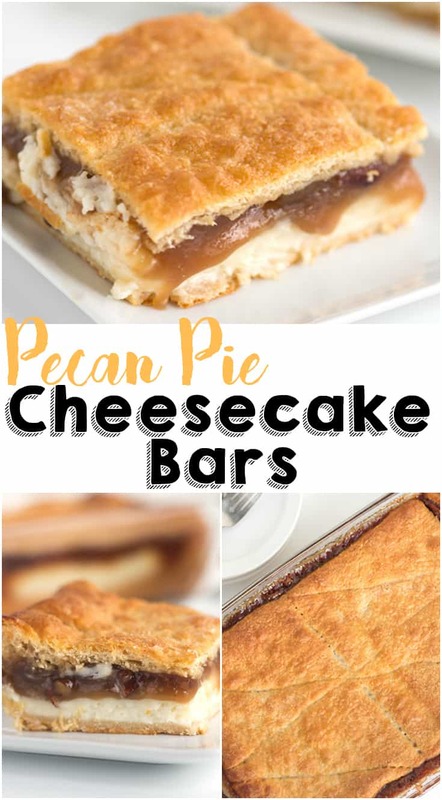 It’s incredibly addicting especially if you love pecans and cheesecake as much as I do! Do you remember that incredibly beautiful blueberry cream cheese danish made with crescent rolls? 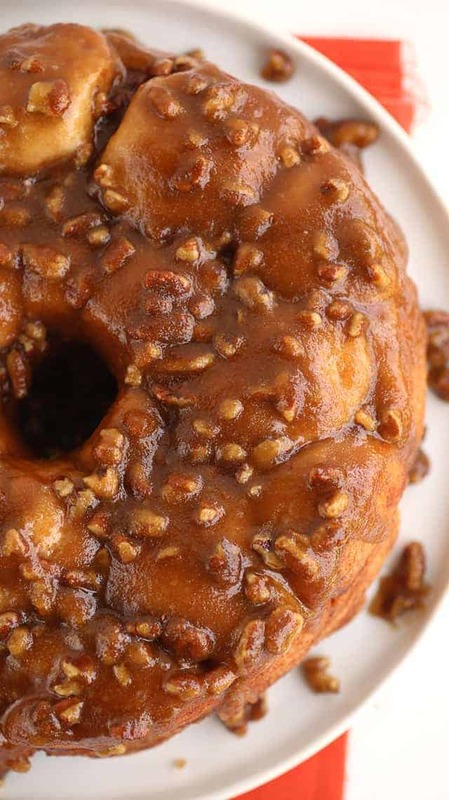 Yeahhhh, this is kind of similar except made into a wintry dessert by using pecan pie filling. Though I love desserts with berries in it, I think I prefer this warm, comforting bar instead. At least at the moment I do. 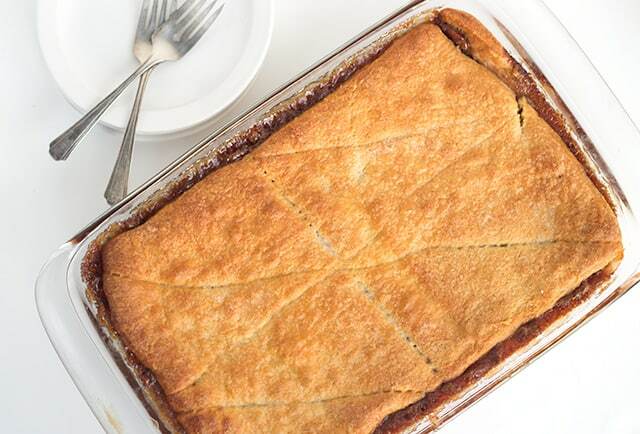 Unlike the normal pecan pie filling that’s extremely runny until it’s baked, this filling is cooked on the stove top before being added into this recipe. With it being thickened before being baked, you won’t have to worry about the top layer of crescent roll soaking up the liquid or falling down into the liquid. Those are both things that can cause unwanted messes. There is one thing that I have to warn you about. Some of that filling will bubble up onto the sides of your pan. See picture above (and cringe). Don’t panic though, it will come off. I normally soak my pan in soapy hot water and that does the trick. I’m not sure if there’s anything you can do to prevent it? Parchment paper? I have a feeling if you add parchment paper underneath the bottom layer of crescent rolls, that it will become soggy. I only feel that way because it’s happened to me every time I try to bake some biscuits with parchment paper on my pan. I really hate scrubbing pans, so parchment paper is my go-to where ever possible. These pecan pie cheesecake bars are acceptable for both Thanksgiving and Christmas. They make for a great breakfast too. So versatile, these bars. <– I actually talk like that. My husband often refers to me as yoda. I can’t believe Christmas is just a few days away. It feels like the time between Thanksgiving and Christmas flew this year. I’m not sure if it’s because I’ve been extremely busy working this year or that my son keeps me on the go. In fact, an hour before he went to bed he told me he needed chocolate chip cookies for his holiday party tomorrow. Since I have a cookie cookbook, I’m obligated to make the cookies now. I feel like there’s a good possibility I may get judged if I have him bring in store-bought cookies. What do you think? 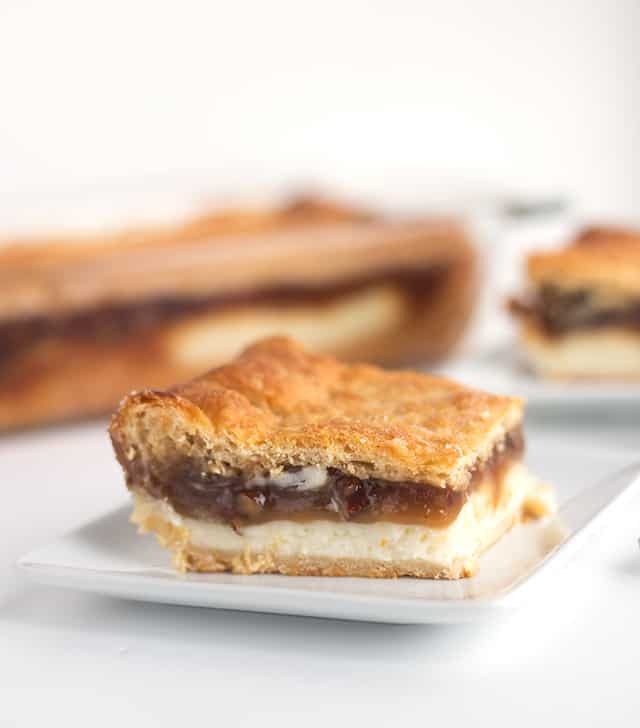 These Pecan Pie Cheesecake Bars combines pecan pie and cheesecake into one delicious bar. It's sandwiched between two flaky crescent rolls. It makes the perfect holiday dessert! Add the butter, brown sugar, granulated sugar, corn syrup, eggs, and pecans to a large saucepan. Mix until completely combined. Place over medium heat stirring constantly until it comes to a boil. Let boil for 6 - 8 minutes until it becomes thick, stirring constantly. When running the spatula on the bottom of the pan, the filling will spread apart and leave a path briefly. Remove from the heat. Stir in the vanilla extract and pecan pieces until incorporated. Add the pecan pie filling on top of the cream cheese mixture. Spread evenly. Place into the oven and bake for 28 - 31 minutes until golden brown. The bottom should have a golden color as well. 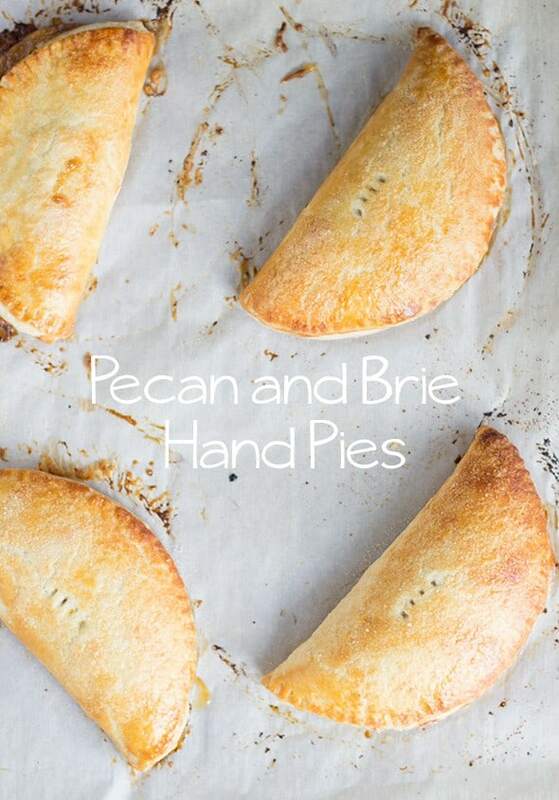 Need more pecan pie in your life?